LiveCode LessonsData GridLiveCode Data Grid Working With Data Grid TablesHow Can I Colorize Individual Lines in a Table? This lesson will show you how to change the color of individual lines in a Data Grid table. Before you being this lesson you will need to read the lesson How Do I Override the Default Behavior for Rendering Data to a Cell? In this example I am going to modify the basic example created in the lesson mentioned above so that it colors a row red if the row's line has error property is true. By clicking on the Toggle Line 3 Color button the color of line 3 turns red. The code in the button extracts the data for line 3 from the data grid, toggles the "line has error" property and reassigns the new data to line 3. 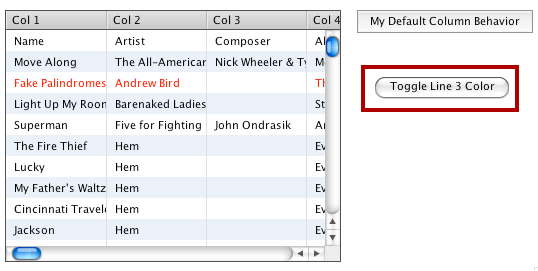 Now let's look at what the default custom column behavior looks like for this data grid. 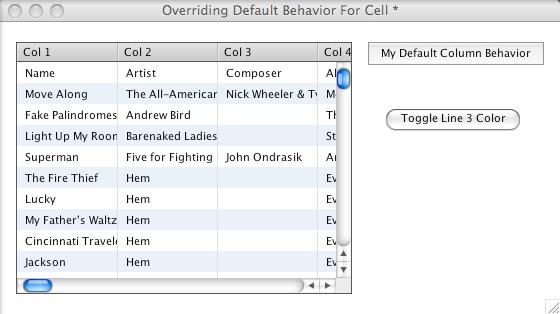 Here is the relevant code in the default custom column behavior for this data grid. The key addition to the code is the SetForeGroundColor handler. This handler checks the value of the "line has error" column for this row (using GetDataOfIndex) and if it is true then changes the cell to red. Since each cell in this row has the same value for "line has error" the entire row appears red. 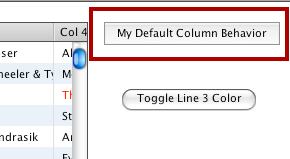 -- A default column is just a field. Prev: How Do I Align Decimals in a Column? Next: How Do I Create a Form with Variable Line Heights?